Pictured above is some of the simple test equipment that I have either built, modified or acquired very cheaply! It doesn't pretend to be anything but simple and cannot compete with the semi-professional installations some microwavers are fortunate to possess. However I can at least get my microwave gear "in the ballpark" with this simple test gear, often enough to make QSOs and certainly ready for the final line up in the lab. However, I am finding that I'm increasingly getting very accurate readings at home, particularly in frequency and power measurement up into the millimetre wave regions. I also have indirect access (via a friend who has a professional laboratory, full of test gear!) to more sophisticated equipment such as an HP noise analyser, HP spectrum analyser, network analyser and accurate microwave frequency counters and power meters up to 47GHz. The following description may be of interest to anyone contemplating setting up a test bench. Frequently available at surplus sales at prices between £50 and £135 depending on the RF head. This one came with a 100mW head, good for up to 18GHz. Treat the head units very carefully as they are easy damaged by shock... eg when dropped just a few inches. Heads for higher frequencies and power inputs are available but quite difficult and expensive to obtain. These are very good power meters for the amateur. They do not appear to "drift" as much as some of the older ones. B Hewlett Packard X382A precision 0-50dB waveguide attentuator for X band. This is not often seen at surplus sales but an extremely useful tool. It is calibrated to 0.1dB for much of its range between 0dB and -50dB. I also have several coaxial microwave attenuators and dummy loads. Whileit does not give a definitive reading it does show improvements made and really this is all one can expect at home! 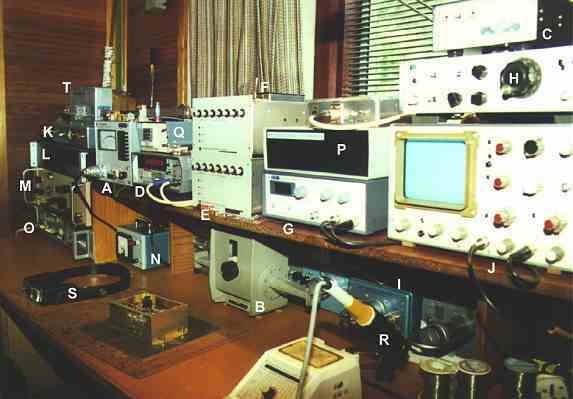 For a definitive reading of Noise Figure I take my gear down to a microwave meeting or to a friend's laboratory. These very good counters are ridiculously cheap nowadays. Surplus ones can be bought for as little as £30. They are good from 0-600MHz. The home made prescaler allows frequencies up to just above 2.6GHz to be read. Plans are in store to make a 12GHz prescaler. As you can see I have two of these versatile units. The Adret is an extremely stable source, with a useful range covering the common crystal oscillator frequencies used for multiplication up into the microwave bands. I tend to leave mine set at 108MHz or 96MHz and drive the varactor multiplier, mentioned below, to give accurate marker signals up into the 10, 24 and 47GHz bands. Because they are permanently left switched on, the 108MHz signal hardly changes over long periods, especially as one of them is locked to the accurate standard described below ( O ). This is so easy to make! It uses a surplus double mixer diode from a satellite TV RF head. The adapter plugs into my oscilloscope, a basic 30MHz type, set to the X-Y position, and allows me to see not only the basic range of 0 to around 1100MHz but much higher microwave frequencies. This is easily achieved by placing suitable mixers (downconverters) in front of the the adapter. I can "look" at at microwave frequencies up to around 33GHz at the moment. However, you have to be certain that you know what you are looking at! The cost of one of these adapters is about half the price of a cheap surplus HP type (eg the HP141). While this unit cannot possibly compare with a proper DC-microwave SA, it still has its uses. Its basic coverage is from 0 to 100MHz but with appropriate downconverters (mixers) it is easily possible to see any of the microwave bands, even 24 and 47GHz! I have found it of immense value in setting up filters for example. Now I have the Thandar adapter (see G above) I tend to use the homemade one for low frequency work. I Surplus Cavity wave meters covering the whole range from approx 900MHz to 14GHz. These are the well-known Wayne-Kerr cavity wavemeters, complete with their individual calibration books. For the low cost that they are, they are invaluable items when checking out oscillator amd muliplier chains. Any old 'scope can be used with the spectrum analyser adapter. This one is a 30MHz bandwidth one and seems adequate for most things I do. I have a couple of other "boat anchor" types also! K G4JNT MSF (60kHz) Locked Frequency Source. This is a frequency marker locked to MSF, the UK's standard frequency station (equivalent to WWV). I used this for quite a while until I built the TV locked source described below. It is a most useful item to establish a standard for other test equipment, such as the frequency counter. Since this photograph was taken I have also built an even better unit, a TV-locked Frequency Standard. Details are found on this website. This is an essential tool for lining up multiplier stages! Do not try to use a digital meter here! I was given this excellent unit in early 2000. Its stability is quite remarkable. I now have it as my station standard and use it to lock all my other oscillators and frequency counter. It is presently - 0.03Hz low at 10MHz and that equates to minus 30Hz at 10GHz.... good enough for me at the moment! It is so stable, having been running continously for many months that I am unable to measure any change of frequency. The unit has outputs at 1MHz, 5MHz and 10MHz, useful as sources to lock other oscillators. Chuck, WB6IGP, kindly sent me this useful pc board, which I mounted in a plastic case so that its harmonics can be radiated far and wide! It is basically a PLL oscillator, referenced against a TCXO 10MHz source, on 1152MHz and harmonics are easily heard up to 24GHz. I use it as a frequency marker when out portable on the hills. I usually switch it on a day or two before I go out so that it is very stable by the time I need it. However it's possible to switch it on a couple of hours before needed and still get excellent accuracy. Calibrated accurately to at least 12GHz and usable on 24GHz, it makes use of a cheap, surplus diode monitor module and a simple meter amplifier circuit. It is a useful standby to my Marconi power meter. To be certain of not damaging sensitive Surface Mount Devices, a temperature controlled iron is essential. Mine is the Vann Draper SL20 and is continuously adjustable up to 420 degrees Celcius and is ESD protected. A small (0.5mm) solder tip still seems too big for some of the modern devices! The RadioSpares headband 2.7X binocular magnifier is a vital part of my work station. Modern SMD devices and microstrip pcbs are just too small for my "old man's" eyesight. These magnifiers make soldering devices to pcbs quite easy. However components are getting even smaller by the week and at least one of my microwave amateur friends now uses a stereo microscope! Many of the units have been described in the RSGB Microwave Newsletter, the RSGB magazine "RadCom" and in the three volume RSGB Microwave Manual.